“Kaifeng is drawn towards notions of private/public space and of territory and structure. He speaks of the need for individuality and freedom along with conflicting desires for security and a relationship with the community. The works by Chun Kai Feng, at first sight, seem to be illustrations taken from a parallel world, shy of human presence. Images brimming with the suggestion of faraway horizons, 10 charcoal drawings line the ‘beginning of the tunnel, from City Link, followed by 5 sculptural models, and 3 coloured drawings on the end closer to the Esplanade. The wall after the sculptures are aptly painted grey, adding to an overbearing sense of melancholy and stasis in the work. The tungsten lights warm the works, pulling curious passerbys to take closer looks at the drawings and sculptures. The works seem to follow this sequence and direction, as they bear illumination into this parallel world, like what one will get peering out the airplane window, or as the artist puts it, ‘from MRT train windows’. A broken narrative unravels, of a barren city devoid of human presence, with architecture built for simplicity and control, seen in the flat walls and barbed wires depicted. The forms are simple, and the function of these buildings, quirky and unknown. Architectural structures rise, with no ladders or staircases that breach from the ground. They are also remarkably uncanny, comical, Bizarro comic strips made alive. One of the mini-dioramas with loud speakers, actually resembles Van Gogh’s room after the painting “Bedroom in Arles” (1888). One of the mini-dioramas, has a smash glass door, with nothing in it except broken glass, as if someone has looted it all. This particular diorama, pointed out by artist Yeo Chee Kiong, perhaps is the interlude, pause or disruption in the narrative Kai Feng has weaved, because of it’s proximity to real life. It is grounded, and bears the familiar scene of smash glass. Chee Kiong adds that it is perhaps this ‘pause’ that makes the viewer possibly appreciate the other un-damaged sculptures even more. 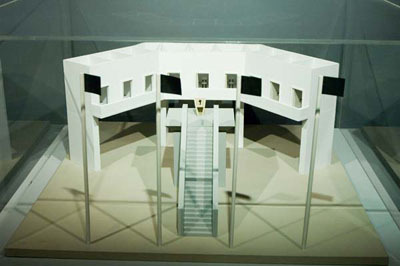 On another level of interpretation, this particular diorama is the set piece of the exhibition, presenting the shock or potential for damage, that adds to the need for security, seen in the drawings and models as fences, raised buildings. These forms of buildings are interesting because we want to acknowledge the psychological impact buildings play on us. What may be interesting to know, is the charcoal drawings came after the sculptures. Kai Feng feels the drawings “give form to the ideas (in the sculptures) in an other way”, perhaps substantiating the creation of such a parallel world, like how J.R.R. Tolkien, an author of fantasy literature that gave the real world “Lord of the Rings” added maps to his stories. The mix of drawings and sculptures enhances each other, suggesting how ideas can take form in two dimension or more. The artists also reveals his fascination with the concept of utopia, and how in history these have led to totalitarian rule. The work “the Optimist” (seen above) is the best example for what he said drew ideas from Michel Foucault’s panopticon mentioned in the book “Discipline and Punishment: the birth of the prison“. A long and tall staircase leads to a podium, facing 9 cells, each with a solitary chair. As what fellow artist Michael Lee remarked, it is interesting to note that the element of power could reside in the ‘optimist’ speaker on the lone podium, or the people that could sit in these rooms. What the work succeeds in doing, is raising issues of private/public spaces and the anxieties we carry about them. It also raises issues of ‘public trust’ or what Singaporean’s refer affectionately to as a subset of Kampong Spirit. It is also perhaps interesting to note that the Sunday Times (May 6, 2007) ran an article of how easily their reporter gained accessed into 3 bedroom flats, on the pretext of using the toilet, than the more ‘affluent’ properties. The article suggested that those in lower income families, have perhaps nothing to lose, hence worry less when opening their front doors to strangers while those that have more valuables, have more to lose, in the event of a break-in. The works here should raise debate about the meeting of public and private spaces, and the functions and needs which they serve as our society grows increasingly affluent, while the income gaps widen. In the light of the global threat of terrorism, the need for ‘Security’ is even greater. Should we provide concrete parks (third charcoal drawing) built like multi-storey carparks surrounded with fences, benches thrown in, so we may feel safe? Who are we protecting our properties from? Or would the alienation cause a greater reaction, and a greater threat or more targets for terrorism? While the works also suggest alienation, because of its depressive muted colours, and subtle undertones; they could also be admired for its wits in off the wall logic and humour. While many artists such as Tom Sachs takes dig at capitalism with carefully constructed models, and Singapore artist Tan Wee Lit (Trading Blows, 2003) that uses constructed toys and models to illustrate concepts, Kai Feng has something going, building a strong message for the need for secure spaces – we just have to watch how we get there, and at what or who’s costs. Thanks for taking the time to write. I appreciate what you are doing. Reading it consolidated what I’ve been exploring and researching, it’s very helpful. Personally what I liked best about the show is the esplanade’s chinese translation of my title ‘我,我本人与全人’. It’s beautiful! It suggests the dichotomy between individual and community and the notion of identity. It’s really broad and it’s pointing me towards several directions that I like to look at in future. Interestingly what I realised is that the english title seems so narcissistic, stressing on the western ideas of individualism. Whereas the chinese version seems to remind us that we as individuals are a subset of community and are dutifully bound to society. It’s so confucius. A very well written piece. The write-up and the photos have helped put together a clearer picture of the exhibition which I, unfortunately, could not see in person. Thanks!